An Unforgettable Day ~ The kind of Memory Every Dad & Every Kid can Hold Forever. My Dad’s not around anymore, my Best Friend, Big Brother and just my Biggest Role Model Ever. A Brilliant Blue Warm California October Day ~ the 11th, his Birthday. His 40th. I remember that Fall brightness, dramatic long shadows and a Santa Ana dryness in the Air. Still my favorite. As usual I mounted my trusty Sting Ray for the less than a block ride to school, lamenting on yet another long year of class drudgery in the 2nd Grade. Back then – at least at my school kids couldn’t wear shorts to school so it was basic chinos. The off-white ones were always my favorite, with perpetually grass-stained knees. Our street dead-ended at the schoolyard, an endless green lawn with huge Eucalyptus trees bordering 2 baseball fields, my home away from home. A Cold-War era Paradise of Escape. I motocrossed at high speed riding wheelies to school, gripping my lunch sack with ‘Freddie’ on it. Crummy Monday SchoolDay. Miss Watson was my 2nd grade Teacher. I was still trying to appreciate her Mildly Dowdy, Quasi-Secretary Style. In the First Grade, I had Mrs. Klenz, who was to say the least, An Absolute Bombshell. She was a Model-Quality Brunette, straight out of Mad Men – about 5’8, I remember she wore Red a lot. Tight A-Line dresses with bare legs and those pointy Jackie-O heels. White ones. Around ChristmasTime Mrs. Klenz would let us boys sit on her lap and seems to me there was a certain amount of kissing involved. Now, at this point in time my Mom wasn’t really around. My Dad and I were Batchelors. I remember him coming to Parent/Teacher night Dressed to Kill for Mrs. Klenz. She was a Hot Tamale and I was Six. What the Hell, I Dressed to Kill for her too. She’d probably be in Serious Trouble these days for some of her suggestive behavior toward us boys, but who cares? Let’s say she was developing in us a Healthy Attitude Toward Women. So now it’s On to Second Grade and Miss Watson, who was a bit more of a bookish but fetching Secretary-type. School had only been on a month so I was still trying to figure her out, get her number so I could charm her with my Nerdish Debonair. My seat was in the middle, not quite in the Coveted Back of the Class, nor the Dreaded Front. So I had to watch it, mind my P’s& Q’s as they say. 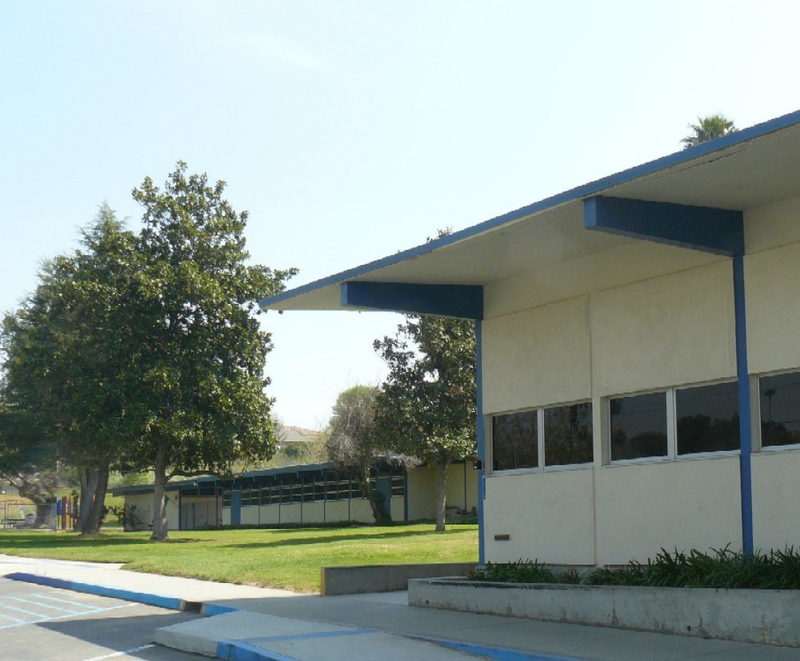 I was still staring out the window across the hallway at Mrs. Klenz, sashaying around out there. Miss Watson can I Stay After School ? Aimlessly Admiring the wafting Santa Ana’s, daydreaming about recess & mildly scheming on my Next Prank. My desk top was up, concealing my Coveted Cigar Box, I’m checking out my stash of marbles, pencils, comic books, pocket knife, rubber bands, bubblegum & Other Cool Stuff. Double Bubble. Accept no substitutes. Back Then we’d do the Flag Salute, belt out 1 or 2 Patriotic Hits like “My Country ‘Tis of Thee“, and “America the Beautiful“. Then Chalkboard Time – Miss Watson will Have Her Back Turned. Prepare to Fire Rubber Band. We actually did the Duck & Cover drills under our desks every day. There were air raid sirens on towers in the neighborhood going off all the time, and once during an Air Raid Drill, I was going to Bill’s Ranch Market in the car with my Dad when the sirens went off. In the field opposite as we drove, a missile silo opened up out of seemingly bare ground and a sinister cluster of 4 Nike ground-to-air missiles rose up in a menacing angle pointed at the sky. The Russians were a Real Threat – and everyone was basically Scared Shitless of Them back then. Nasty loud Fighter Jets were Blasting around all the time – Badass F-104’s – Sonic Booms – BAM. Nukes in the Neghborhood – Should I be Fascinated ? Or Terrified ? In the middle of all these Kennedy-Era Nuclear Panic Schoolday Shenanigans, who should appear at the door of my class, silouhetted against a brilliant October sky, but My Dad. 6-foot-two, 200-plus, short-sleeve white dress shirt, skinny black tie, size 11 Wingtips. Presenting a Serious Threat if I’m in Trouble. A Furious instant-Adrenaline rush of Sheer Panic ran down my spine. Immediately Sweating Profusely, my mind raced to think what Horrible Thing had I done to have my Dad show up at class? What girl’s honour did I insult ? Whose eye did I almost take out with a Deadly Rubber Band/Paper Clip shot to the forehead ? Remember that one? STOP THAT BEFORE YOU TAKE SOMEONE’S EYE OUT ! A Million Times. In a millisecond, all this is causing me to start thinking up an excuse for something I haven’t even been Blamed For yet… He confers with Miss Watson as I Await my Fate. I pretend to be casual about it…’Oh, Hey Dad’. A designed-to-charm Adults-Casual Wave. COME UP HERE SON. The entire class goes silent – pondering my crime. I shuffle to the front, Dead Man Walking. “And uh, hey Dad, by the way, where are we goin? “Oh, you’ll see son”. Great, Jesus – at least I know I’m too young for the Penitentiary. Suddenly we’re on the freeway, going north, into Urban Sprawl. I have No idea. No Clue (as usual). I start to Relax. My dad’s got a mild Cheshire Cat Grin going..and it IS his Birthday, so it finally hits me..We’re going to Do Something Super-Cool ! I just don’t know what. As usual I’m just happy to be cruising in an open Sports Car with those Triumph cut-down doors, Buzz-Cut in the Breeze, sun on my face as always and pretty much my whole M.O. since. The Only Way to Fly…I was lucky to grow up with said Triumph, Jaquars, Lotus, assorted American Muscle and a constantly-changing assortment of Cool Wheels ~ Cool Jazz on the Radio. I had yet to acquire one of the approximately 8-10,000 pairs of shades I’ve had since, I remember thinking,’I need to get some’. Mr. Six-year old Cool. And it Suddenly Comes to Me… ‘Dad ! Dodgers ! World Series !’ And he couldn’t keep it a secret any longer. Yep, that’s right. 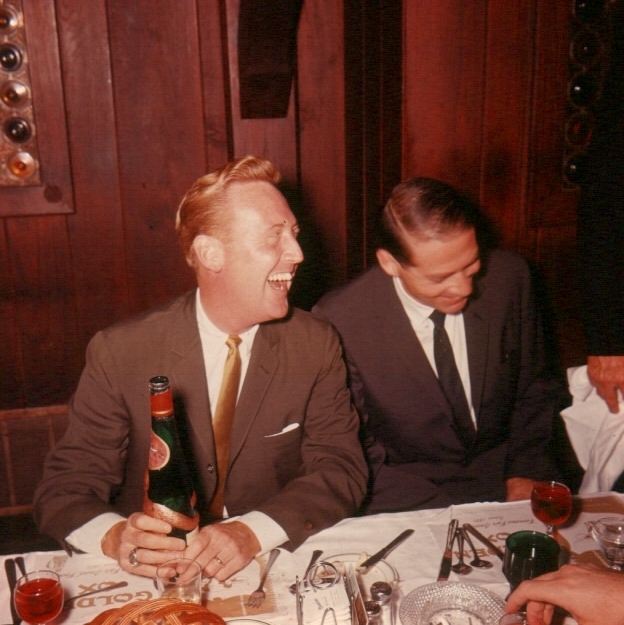 My Dad on his 40th birthday – Busted me Out of School to take me to Game 5 of the ’65 World Series against the Minnesota Twins. 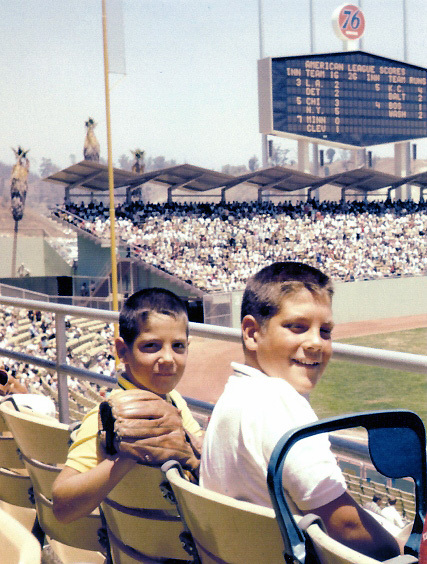 The Twins to me, in my Lifelong L.A. Dodger World, were Nobodies. I was born in L.A. in ’57. The Dodgers Came to Town in ’58. My Mom was a Brooklyn Dodgers Fan. Way more hard-core than my Dad ever was. It’s in my blood, which is Dodger Blue. This day, none other than One of the Greatest Dodgers of Them All, Sandy Koufax is Pitching. 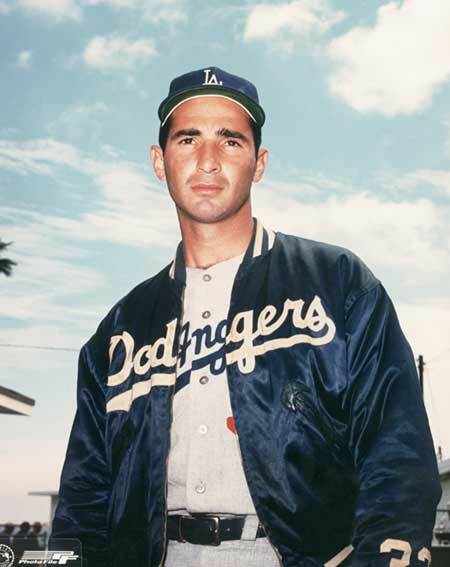 Koufax ~ The Greatest Major League Pitcher – Ever. I had seen Koufax pitch. I have seen Drysdale. Juan Marichal of the Hated Giants. I have seen a lot of Great Pitchers. Bob Gibson, Vida Blue. Nolan Ryan. Fernnando Valenzuela in his M.L. debut. 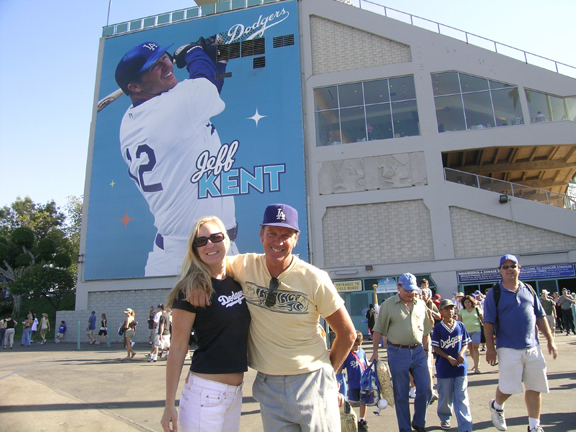 Since it opened and partially because of this day, I have been going to Dodger Stadium my whole life. 50 years. Another of the greatest modern pitchers I’ve ever seen is Mariano Rivera of the N.Y. Yankees. 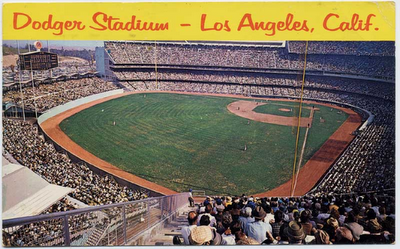 When you look at pictures like these of that Pastel Blue L.A. sky that matched the awnings and seats of the Stadium, they have a particular washed-out look to them… partly because of the film quality of the era and partly – which is never mentioned now, L.A. was Incredibly Smoggy in those days. Everything was perpetually Hazy. Nobody gave a damn about Air Pollution back then.. The EPA? What’s that? Didn’t exist yet. All those Hazy Colors in a Haze of Smog. Fill Up the Rocket 88 with Hi-Test. Put a Tiger in Your Tank. The other Great Thing about the Stadium back then…T.V was still relatively new, having only been around about 15 years at that point. And some of the games were broadcast on T.V., some were not. 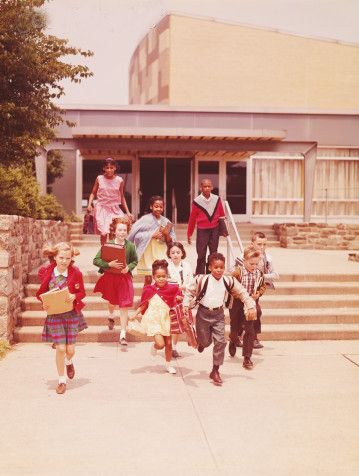 Then everybody, Everybody – had a Transistor Radio. It’s rare these days at the Stadium, but a great Dodger Tradition has always been the Businessman’s Special. There were many more Day Games back then in the Era before Prime Time this and that. All the Businessmen came to the Stadium with Transistor Radios in their shirt pockets, and earphones. They left work midday so they could listen to Vin Scully. Then and Now. The “Official Voice of the Dodgers” since 1949. No Mega-Video Screens, just big scoreboards & Union 76 Balls in the Sky. ‘Fast Food’ was a Dodger Dog and a Beer. Still the Best thing Ever at the ballpark. The Best. Koufax Blew Away the Twins that day. 7-0. The third straight game they won in the Series, which of course they went on to win. The L.A. Dodgers could do no wrong in those days. The days before the owners aired their divorce or drug habit, or infidelity in the media. Days before personal scandal made bigger headlines than the game, or the players themselves. This story isn’t about Sports Facts, Trivia or History. ESPN shows the same loop of ‘highlights’ and innocuous meaningless rhetoric. 5 ‘sportscasters’ lined up trying to say what the Incomparable Vin Scully can do with one phrase or sentence to Paint the Perfect Picture of the game. He is truly the Greatest Sports Story of our time. Irreplaceable. There will never be another like him. My Dad’s gone now, and my Mom as well, the Biggest Brooklyn Dodger fan ever. When I go to the ballpark now, or hear the most esteemed Mr. Scully on the airwaves. it takes me back to that day. His voice is literally the only audible voice I have left of that time, and I cherish the sound of it for the memory of that day so long ago, in Second Grade. 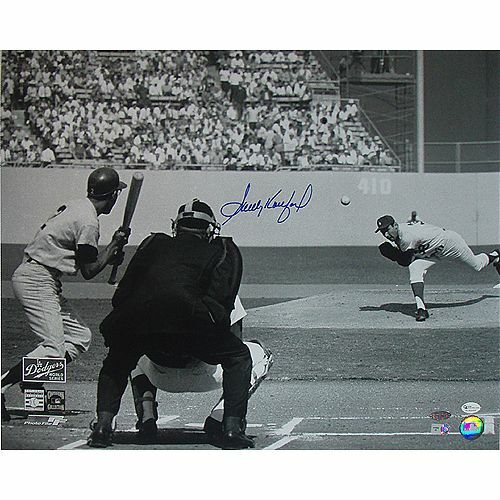 Koufax and his immortal high kick, and a Fastball Out of Nowhere. This entry was posted on February 21, 2010 by federicodecalifornia. It was filed under California Icons ~ and was tagged with California, Dodgers, History, Jazz, L.A., Vin Scully, vintage.